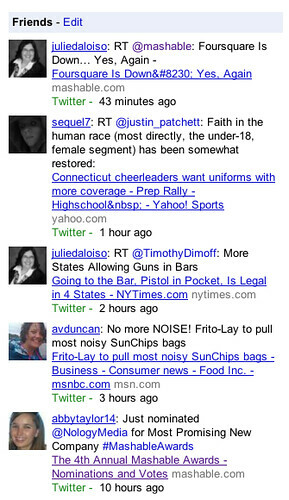 Google is testing a new feature that lets you connect your Twitter account to Google News. Some people are seeing a “Friends” box on the right hand side of Google News inviting them to do this. The friends box asks you to enter your Twitter username and click “Save.” When you click save, Google News will refresh, and you will see a list of updates containing news articles shared by the people you follow. Google even has a help document on this feature. Google’s help page on the feature clarifies that the Friends box only shows you links to news content that can also be found in Google News. Other links they share, if they aren’t Google News-worthy, so to speak, won’t be shown.